Protect your ILL items from being lost for a year or ywo! Does it bother you that the items you loan through the ILL program may often be lost for a year or two? Aides in borrowing libraries may shelve your assets in their library and be lost among their assets. This is more expensive than you may think. If a loaned item that cost $75 with processing, is lost for only two years of its six year anticipated life, it costs you at least $25 plus labor, aggravation, & loss of availability to your patrons. If that loss could be prevented with the investment of less than one cent per item for an ILL item label, would you consider that a good investment? These labels with our "near-no-res" adhesive are removed easily (with a plastic peeler) and cleanly (leaving no label scraps or gummy glue), upon the return of each item. ILL label roll(s) 7/8"x1/2" 'Do ILL items get lost for a year or two?" 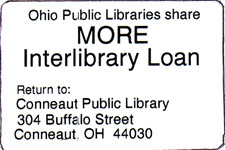 Labels for use on the spines of ILL Inter-library loan books. Highest ROI of any of our processing labels. Directions for returning ILL books & certain other items. 500 count 1.2" x .9" labels per roll. General Purpose adhesive. Place on library prepared paper band around the book. IBL Label Roll(s) .75"x1.38" Fl Green & Black permanent adhesive 800/roll. These Inter Branch loan labels are fl green & black, permanent adhesive labels are packed 800 per roll. 3020 Custom 'super-no-res' adhesive labels 3"x2"
Price by roll of 500 labels.